a little naughty, originally uploaded by Craftydiddl. I found out some exciting yesterday when i was skimming the Ravelry forums. There is a new yarn shop opening sometime in the future like 5 mins away from me–I am super excited about that-but it also means i might have to board up the front door so i can’t get out and spend money there. A Easter FO for you tomorrow!! A new yarn store right near you!! That is the best news. Lovely yarn. Don’t worry about being naughty. As long as you confess on the blog all is fine. Gurl you don’t want to know how naughty I have been! AND my fav LYS is having their anniversary sale this weekend too! Ugh! 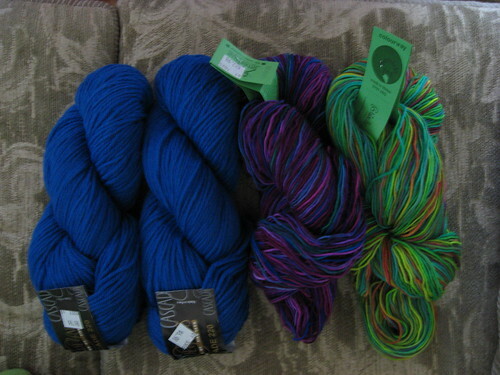 I lurve me some Jitterbug yarn!! Can’t wait to see what you do with your purple colorway!